About Frames Pest Control, Inc.
Frame"s Pest Control is a third generation family-owned and operated business that was founded in 1972 by Shorty & Mary Ellen Frame. We service northwest Ohio and southeast Michigan, from Detroit to Bowling Green & from the Indiana border to Sandusky, with customized pest management systems. 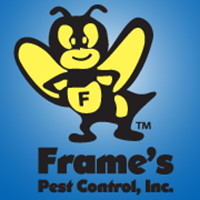 Frame"s provides the most up-to-date services proven to eliminate pests such as termites, ants, wasps and bed bugs. Detailed written reports are provided for each service, and we follow the strictest standards for pest elimination in the industry to ensure the safety of your family, pets, homes and businesses. Get the best. Choose Frame"s Pest Control over the rest! What people say about Frames Pest Control, Inc.
We have been very pleased with Frames Pest Control. The staff is always very friendly and professional. We would recommend them to anyone looking for pest control !! ~Amy at Orchard Terrace. Great service. Your technician Tommy was professional, knowledgeable and offered helpful tips. Also, you were able to get out to my home the same day service was requested. All at an affordable price.